The British press are hard to please, easy to rile. They like things simple, especially where sportsmen are concerned. Success must come with humility, an easy-going nature and a certain level of good looks. Most importantly of all, they demand a willingness to ‘play the media game’ – to welcome the attention, laugh it off when it turns nasty and accept the media’s game must always be played on the media’s terms. 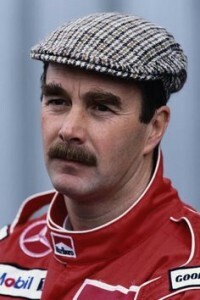 Nigel Mansell is one of this country’s greatest ever drivers. Unfortunately, he didn’t fit that media formula and refused to play the game. As a result, he’s never been truly loved, or given the respect his achievements deserve, by both the motorsport and the mainstream press. Mansell just didn’t belong in any of the lazy categories the media likes to peddle. In the outwardly glamourous, super-rich world of Formula 1, Mansell was the outsider who mortgaged his house and worked 20-hour two-job days to pursue his racing dream. No buying your F1 drive with Nige, no sponsors that he could bring to the table. Mansell earned, truly earned, his place through talent, self-belief and physical and financial risk. It was rags to riches stuff, but the press didn’t buy into it. Why? Because Mansell never bought into them. He so desperately wanted their respect for his struggle that when it wasn’t forthcoming, a sense of persecution and deep mistrust filled the hole instead. The lower middle-class boy from the West Midlands. The Brummie-lite drawl. The Caravan Club moustache…Mansell was the extraordinary talent inside an almost laughably ordinary shell; a Ferrari trapped inside an Austin Allegro. He was so British – so English – and he stuck it to the playboys and the show ponies of the cosmopolitan F1 circus. It was the perfect British success story and it earned him mockery. In Italy, where they appreciate a good moustache, the Ferrari fans called him ‘Il Leone’ – The Lion. Back in Blighty, he was deemed ‘boring’, ‘difficult’, ‘tetchy’. He had zero self-awareness and a chip on each shoulder. 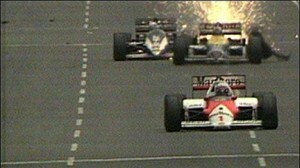 Mansell once described the British press as ‘corrupt’ when they refused to rank him right up there with Senna and Prost. He was never shy when it came to bigging himself up. It didn’t help that Mansell would often flit between first and third person, and occasionally the royal we, when describing himself and his struggles. The press wanted to shoe-horn Mansell into one of those three easy categories. The truth is, Mansell belonged in all of them. He was complex. Ordinary and extraordinary, gauche and proud and bitter. But when seen through a purely sporting lens, his career was simply magnificent. The desperately unlucky failures, epitomised by the high-speed blow-out in Australia just 19 laps from the finish that would have won him the world championship, made his eventual title-winning season in 1992 so, so sweet. The triumphant switch to Indy Car racing, the thrilling battles with Senna and the iconic moment when he gave the Brazilian a lift back to the pits at the British Grand Prix – all glittering stuff that the British press sought to kick the dust over. Mansell was a balls-out, take-you-all-on man who thrilled fans around the world. If he was clouded and complex off the track, he was a racer pure and simple on it. And the public loved him – two BBC Sports Personality of the Year awards was testament to that. Which, ironically, means Mansell fits perfectly into the final lazy category so beloved of sports journalists: ‘The People’s Champion’. 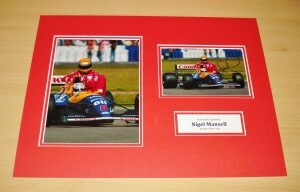 We have a superb selection of personally-signed Nigel Mansell memorabilia, part of a comprehensive motorsport collection. This entry was posted in Sport on September 4, 2015 by [email protected].